The Aristocat Register was formed in the late 1980's. It originally came into existence to allow Autotune Aristocat kit builders to keep in touch with each other and help pool information and solve any questions they may have. This basic concept is still one of the objectives of the the Register but the idea has been enlarged to allow past and present Aristocat builders, in addition to the car manufacturer, Autotune, to help others by means of a Magazine 'The XK Spirit', published 3 times a year. Split screen fitting, electric door windows etc. 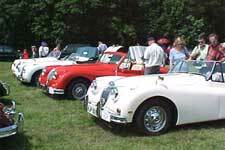 Being a member also allows discounts to be obtained on vehicle insurance, spare parts and entry to some of the many functions/meetings for Kit Cars & Replicas countrywide. For the Aristocat builder / owner:- you are never alone. There is always someone at the end of the phone or on a computer who can help or just be a sounding board for ideas or possible solutions. Don't ever hesitate to call or mail us. See our contacts page. Annual membership of the Aristocat Register costs just £18. Overseas membership is £25 per year. However, if you opt to receive the XK Spirit magazine on-line, the annual membership fee is only £15 regardless of where you live. Please contact the secretary for details. The on-line edition of the magazine is usually published within one month of the paper edition.